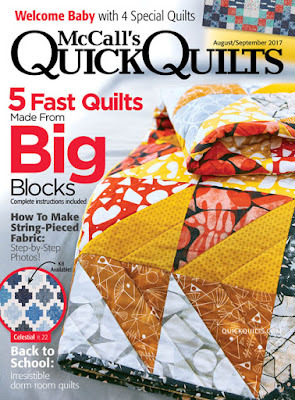 Introducing Against The Grain, available now in the August/September issue of McCall's Quick Quilts. 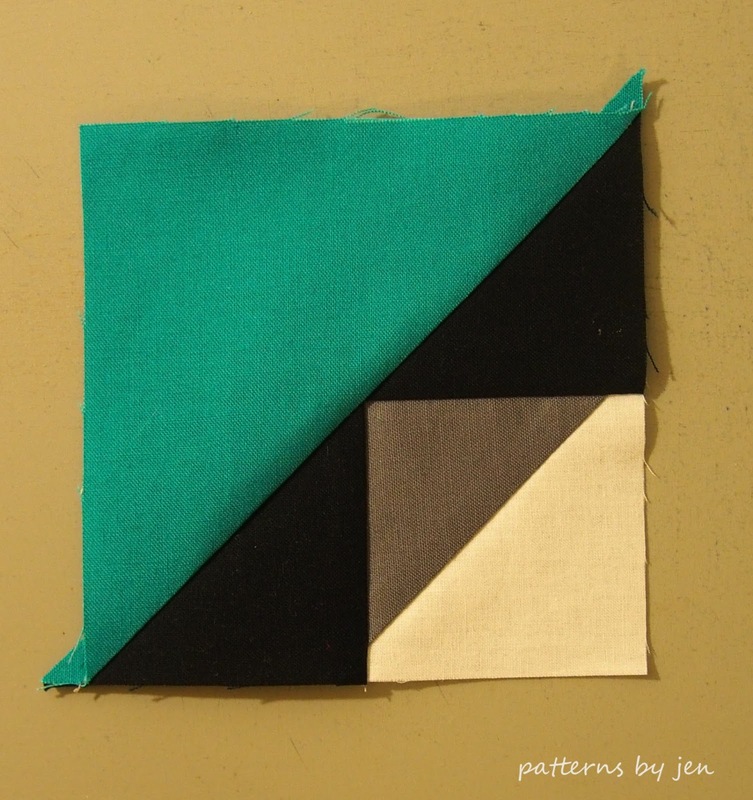 This pattern is made from one block and three colors. I love this cover! Find it in stores now. OR! Scroll down to enter for a chance to win a copy. 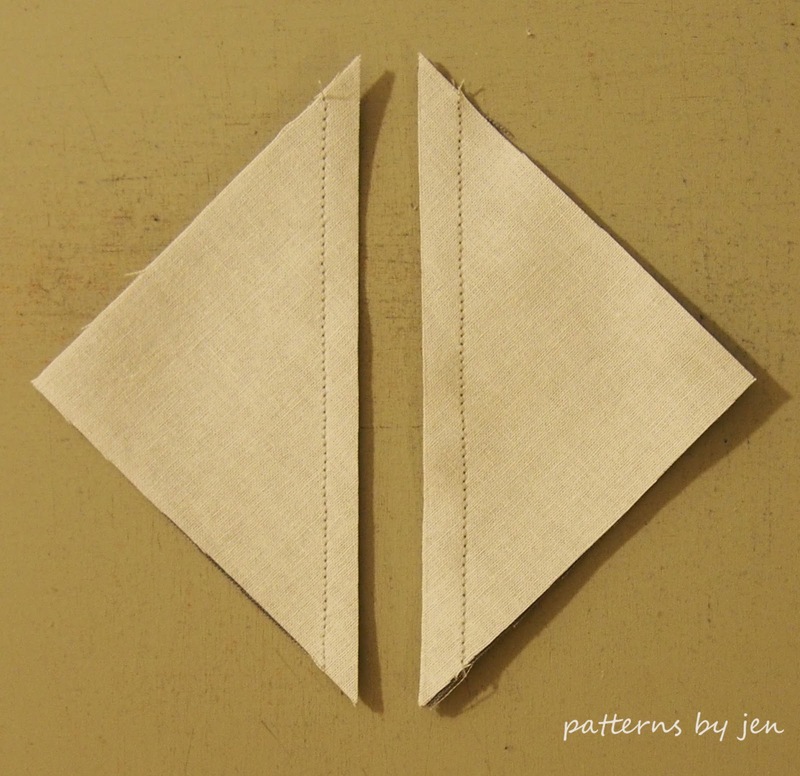 Find more information on this pattern HERE. 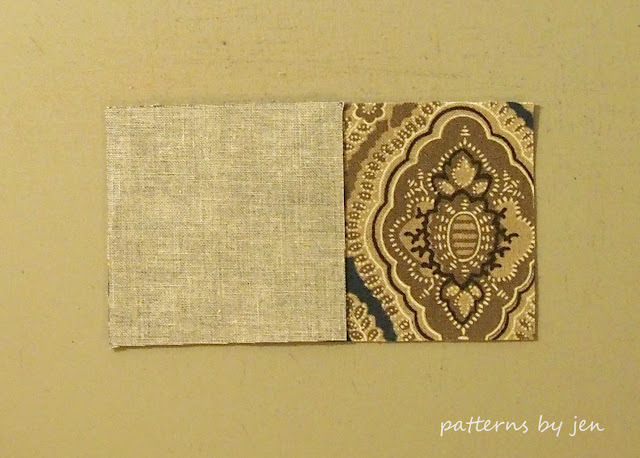 As an added bonus I have a little miniature pattern for you. 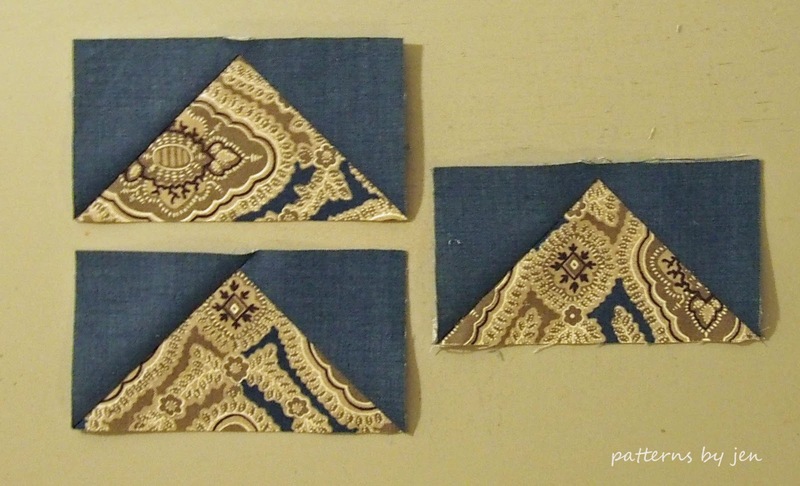 There are a lot of trimmed HST pieces left from these blocks. 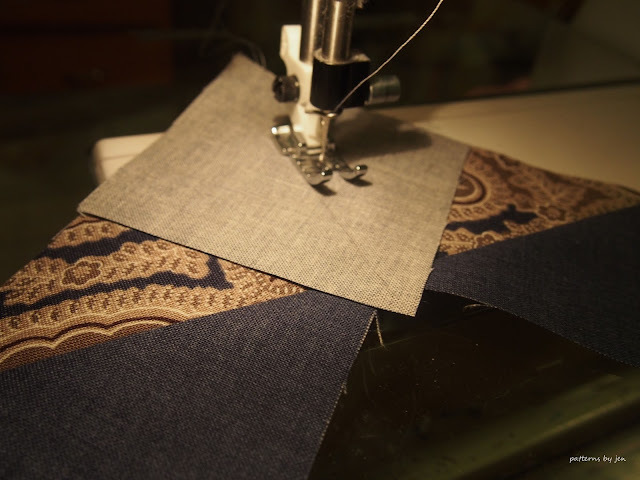 Go HERE to see how I trim my HST units. 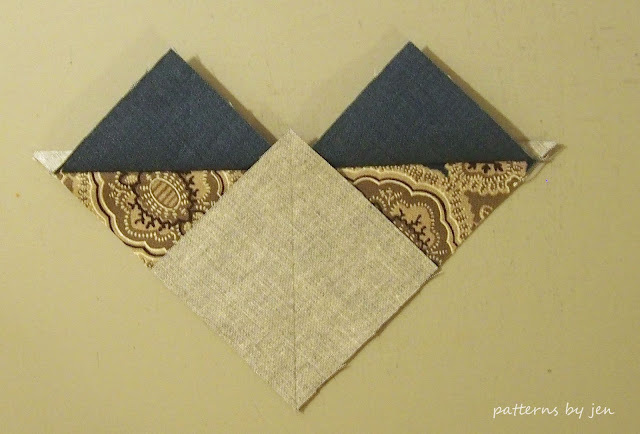 These trim nicely to 1 1/2" squares. 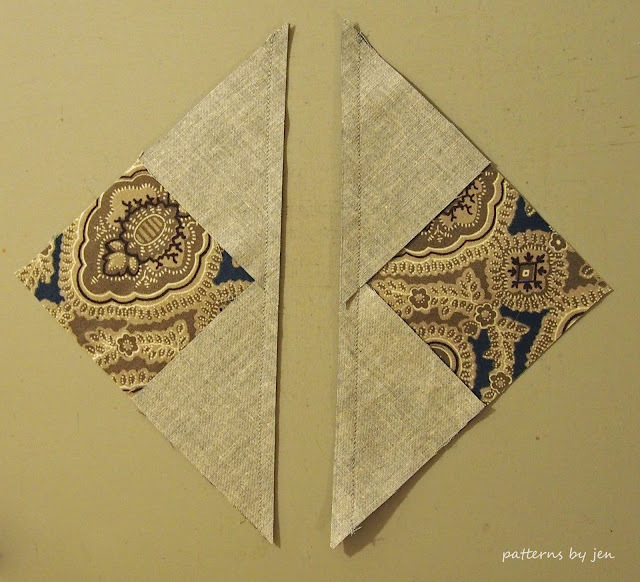 Two 2 1/2" x 8 1/2"
Two 2 1/2 x 10 1/2"
To make a hanging strip for your mini go HERE. Ready to win a copy of the August/September 2017 issue of McCall's Quick Quilts? 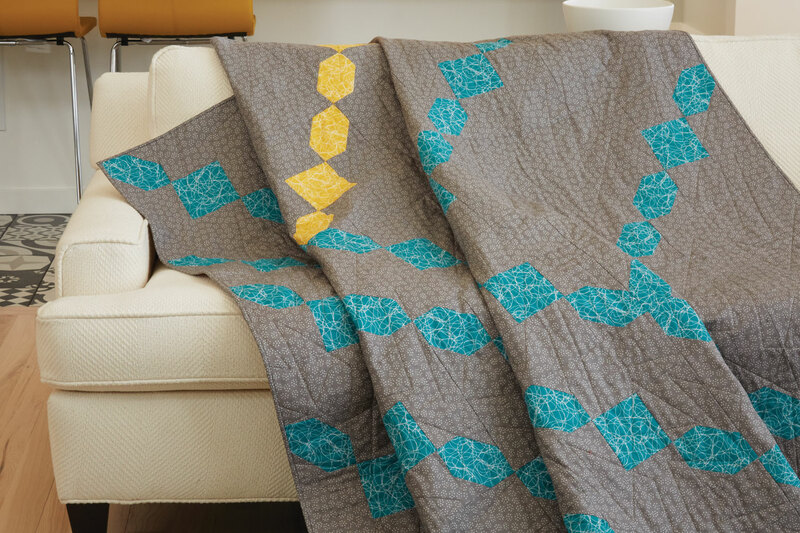 Simply leave a comment sharing your favorite quilt size to make. 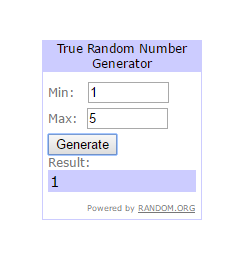 A winner will be announced Wednesday, July 5th. 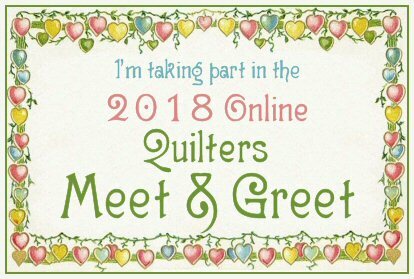 Please leave an email address, many commentors are "no-reply" and that means I cant tell you if you are a winner. Good luck! If this is your first time visiting you might like to check out the Beginner's Unite! 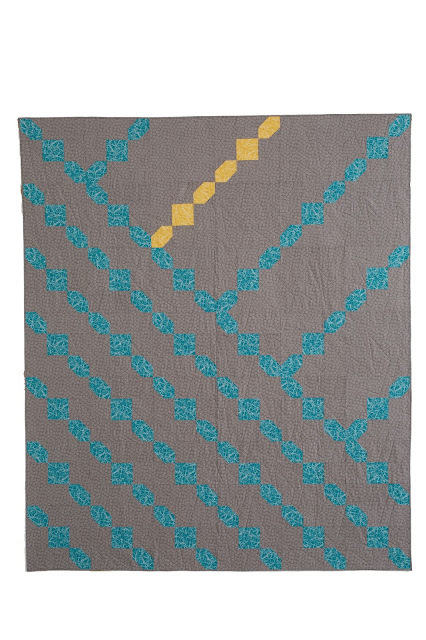 Series as well as the Muggamo Quilt Along, which has a new pattern coming on Sat! 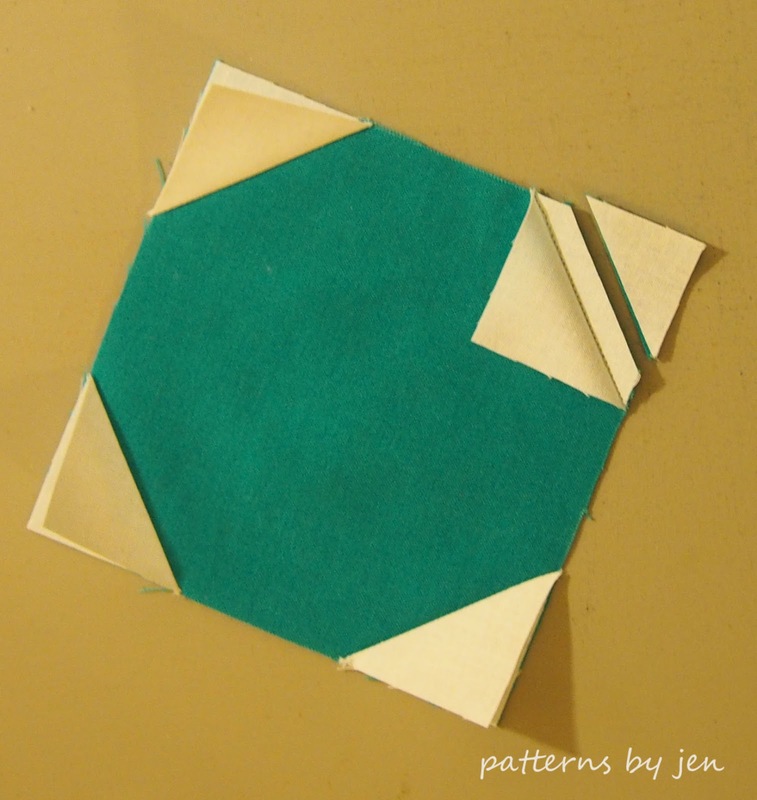 What do we do when our blocks aren't the same measurement? Many people say trim them all the same size, but then you run the chance of losing your points. If you have used the same seam allowance for all of your stitching, then I say, don't even think about trimming! 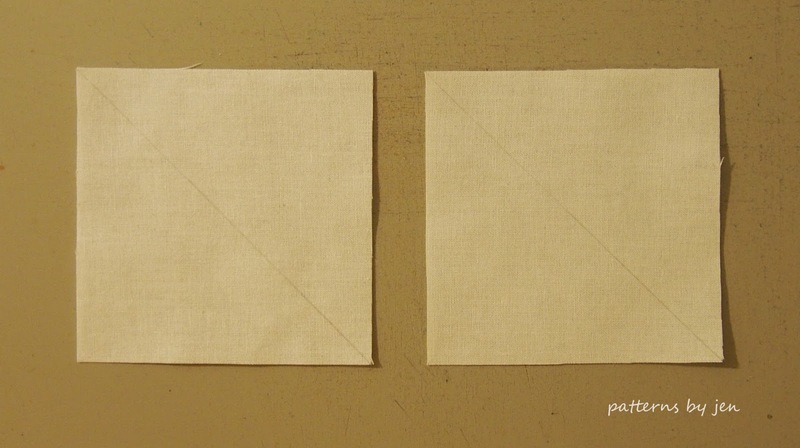 Here are two squares. 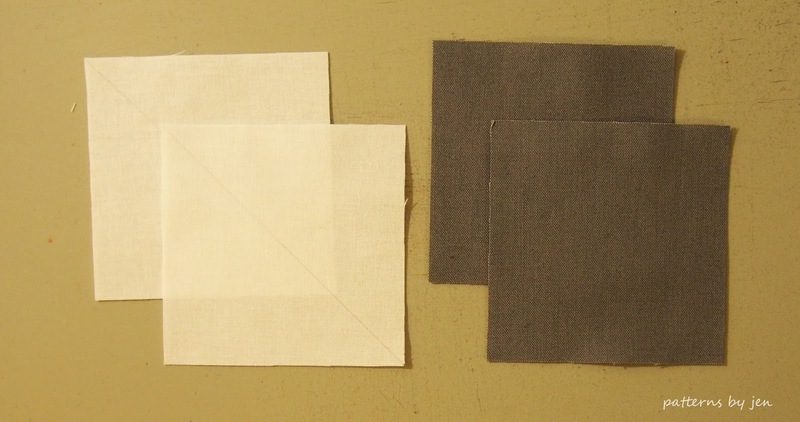 One is 8 1/2" square and the other 8 3/8" square. 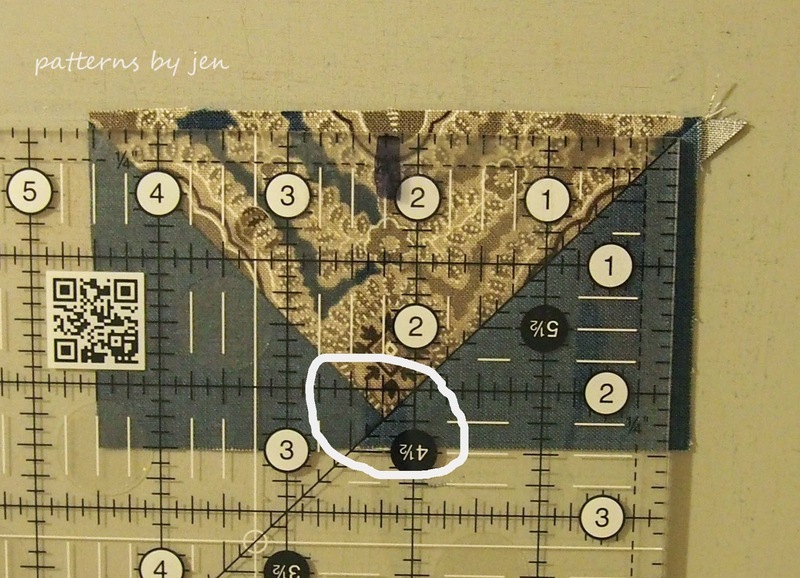 When I come upon blocks that are off just a bit, my go to tip is: pin, stretching just a little bit if you need to, and stitch with the larger unit on the bottom. I pin each end first. Then holding each end I pull the blocks straight to find the middle, and pin. If the block needs a lot of work, I will pull the block straight between the end and middle pins and put in another pin. With these blocks I had seams that I needed to match up as well. 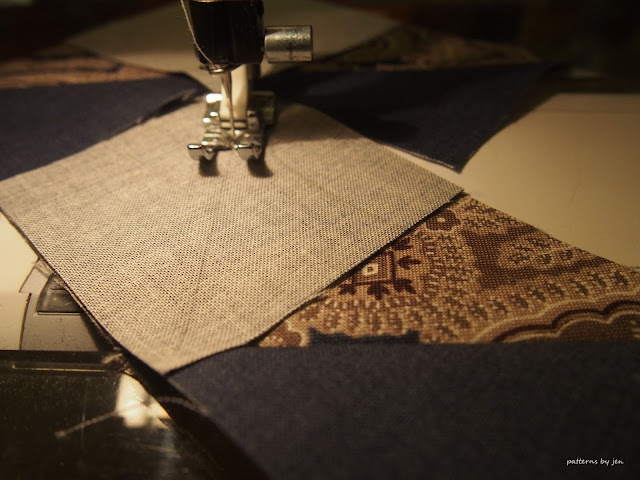 Once pinned, stitch with the larger unit on the bottom. 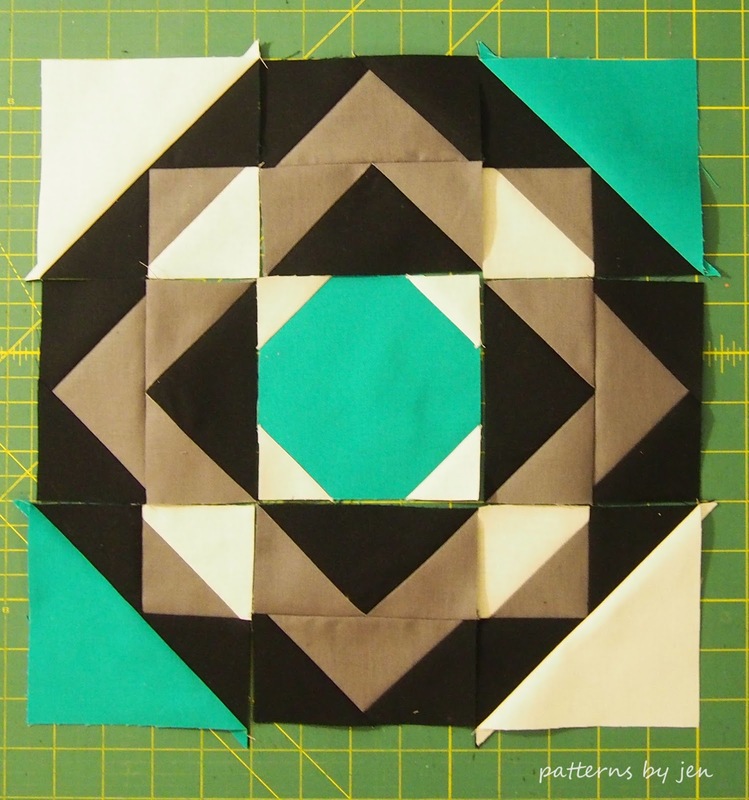 In this case, the 8 1/2" block. 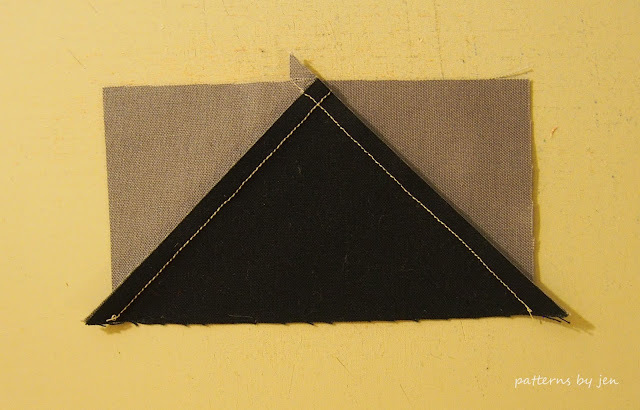 The feed dogs will pull the bottom fabric more than the presser foot will pull the top fabric, and this will help make the blocks the same size. 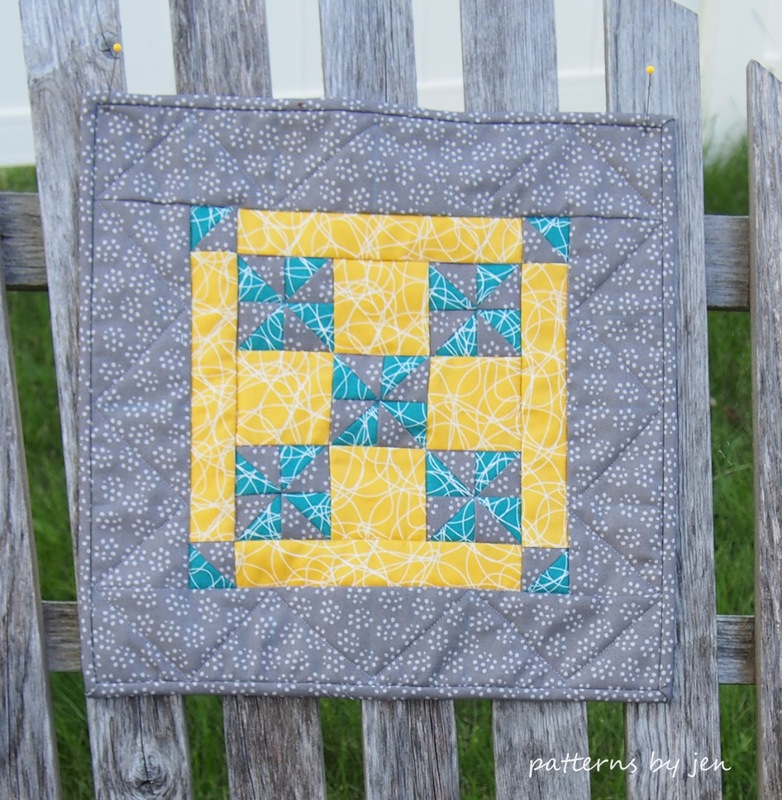 Blocks are now matching at 8 1/2". 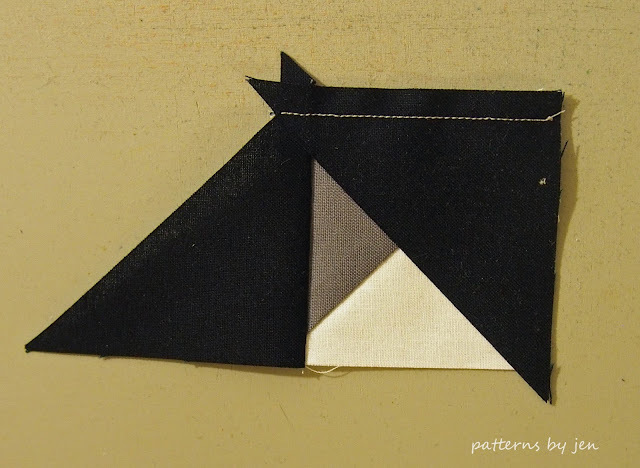 If you are putting blocks with sashing, the same tip applies. 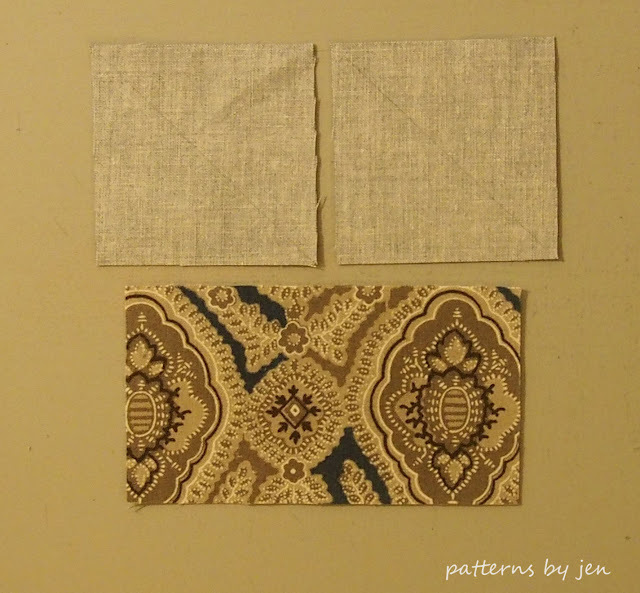 Pin ends, then middle, and in between. 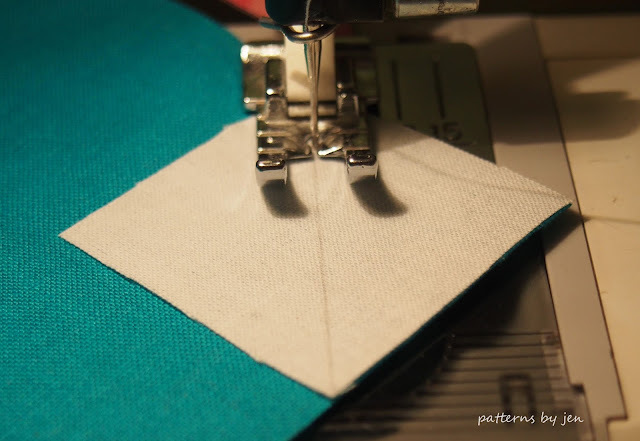 Stitch with the longer piece on the bottom. 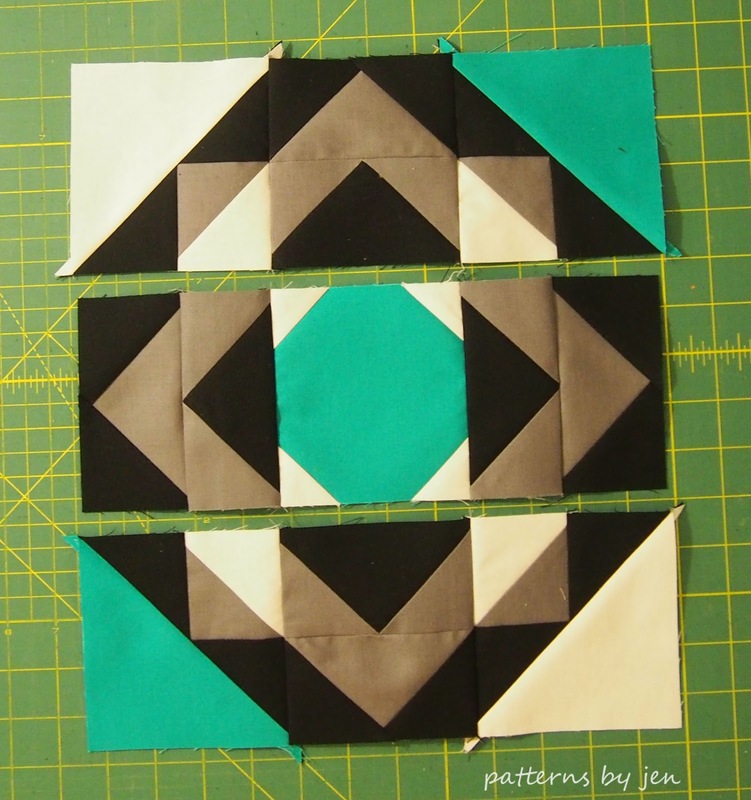 When you put your units and/or blocks together in this manner, there is no need to trim before piecing them together. 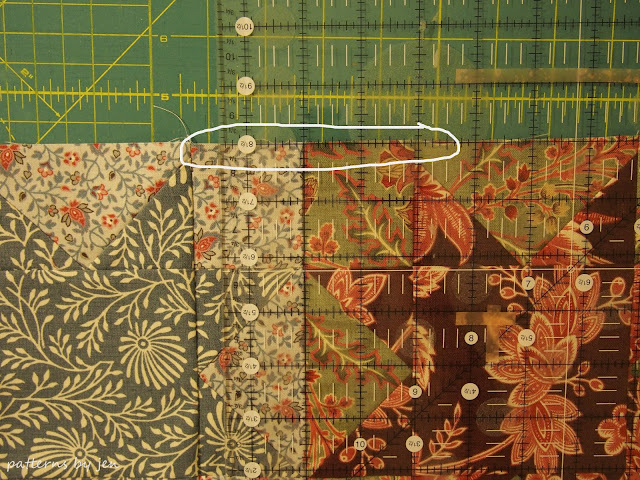 However, if your blocks are 1/4", or more, off I recommend grabbing your faithful seam ripper and fixing the block. Trying to stretch that much fabric will distort your finished block. Share your tips for dealing with units/blocks that are not the same size in the comments. 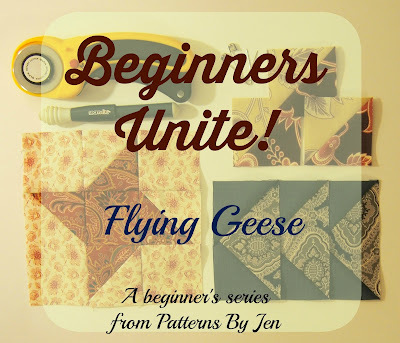 Flying Geese is the next unit in the Beginners Unite! series. 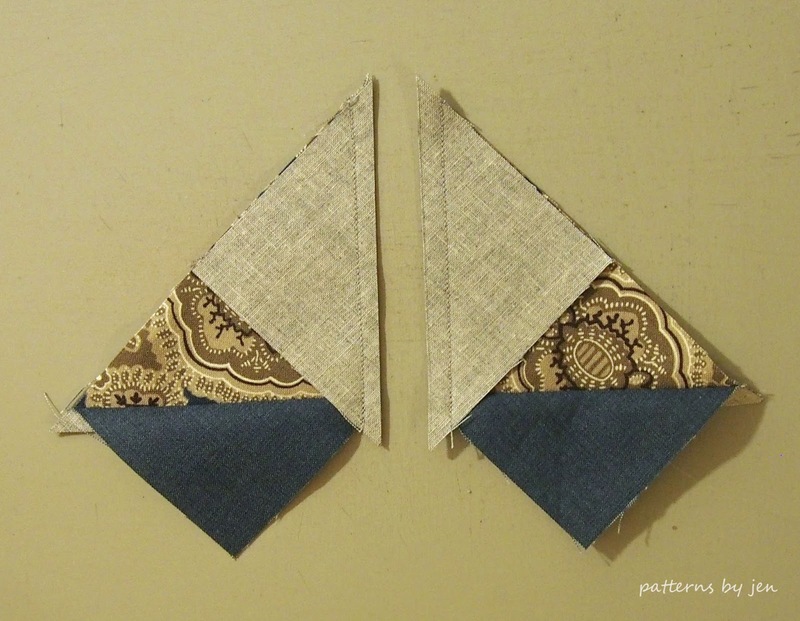 Flying Geese units are heavily used in quilt patterns and it's worth getting them trimmed and perfect. 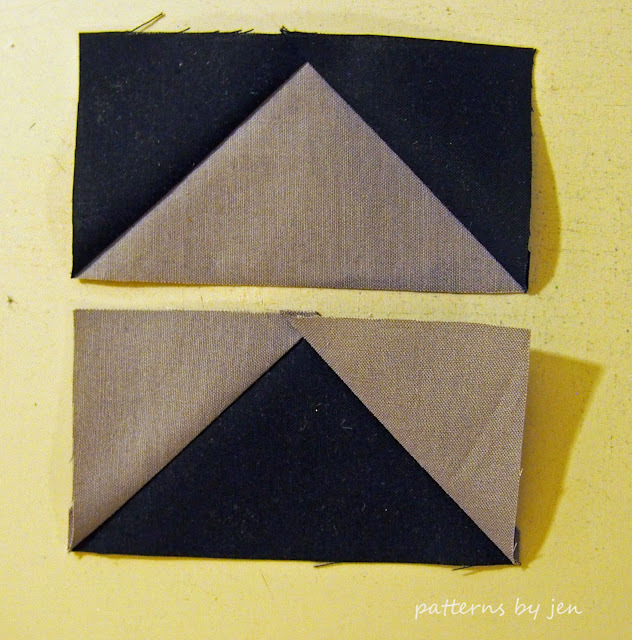 Just like half square triangle units (HST) there are different ways and rulers to use when making Flying Geese. In this post I will show you how to make them the old fashioned original way and how to make them using the No Waste method. I will also show how to trim them if you make them over sized, using a Wing Clipper® from Deb Tucker 180 Design Studio (no affiliation) and just a square from Creative Grids. 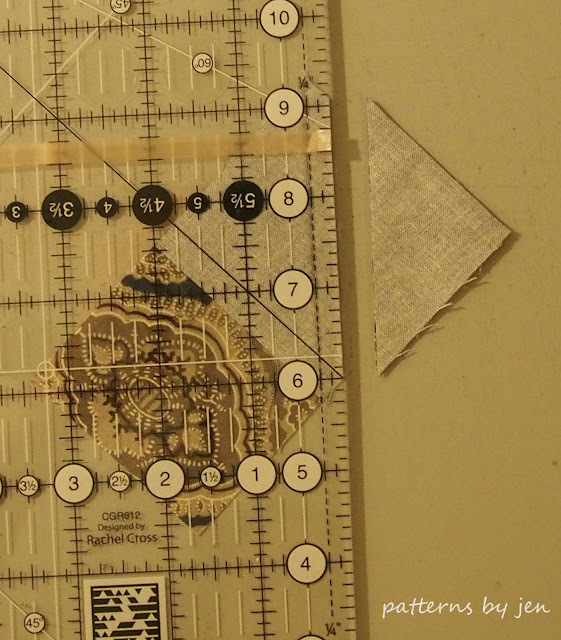 The measurements I'm using in this tutorial are for over sized FG units. 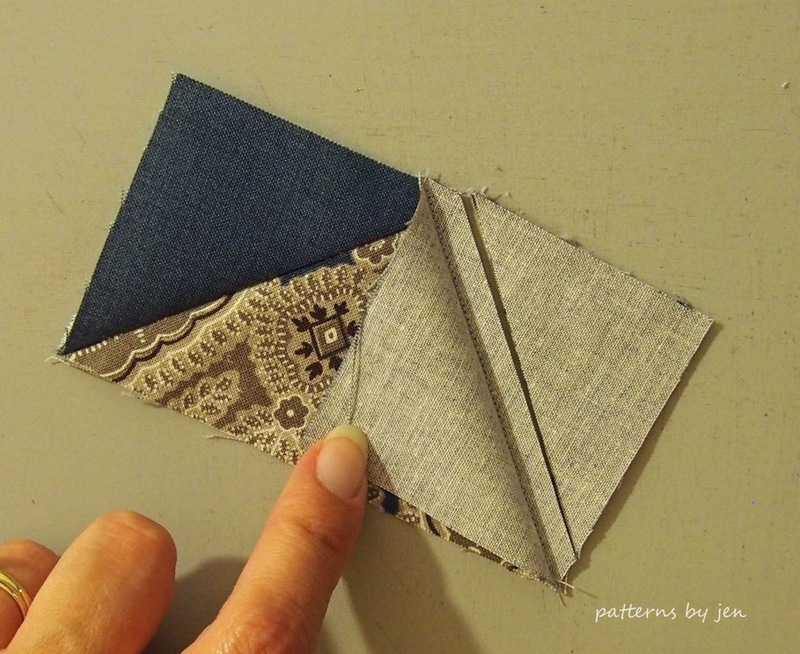 but the instructions for piecing are the same even if you make them to be exact. 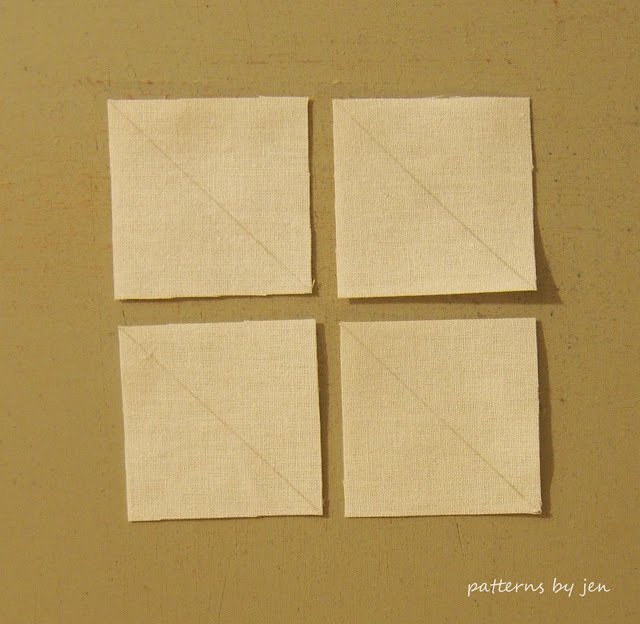 On the wrong side of the 3" squares draw a diagonal line. Place two of the 3" squares on the 5 1/2" square, right sides together, as shown. 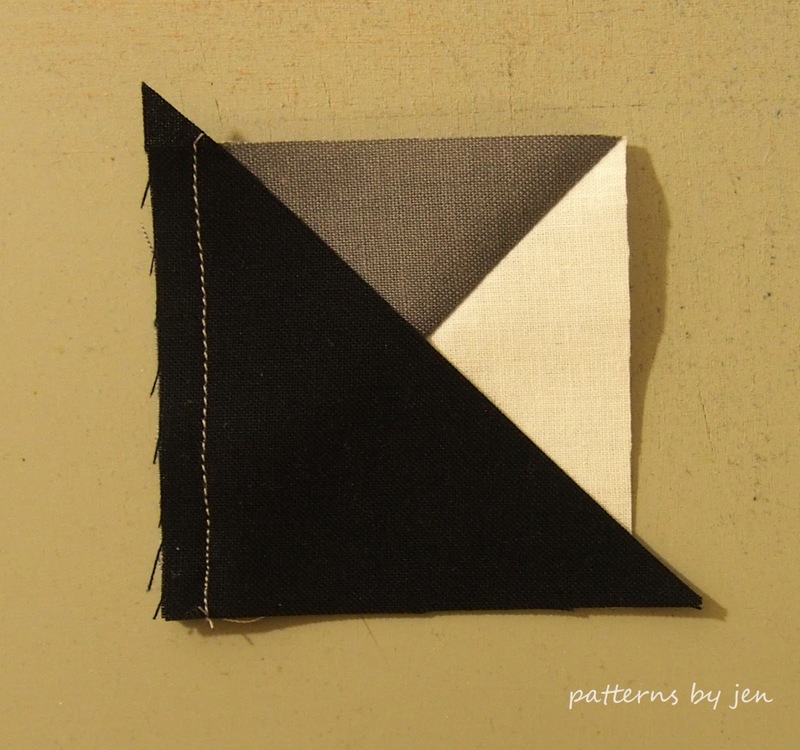 Stitch 1/4" on either side of the line. 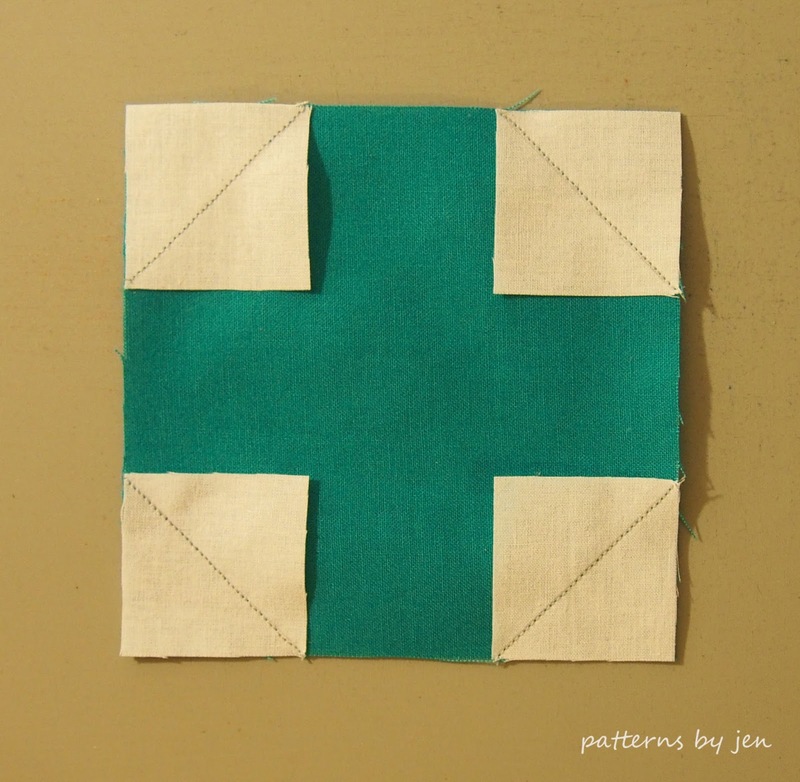 Place a 3" square on each of the units made. 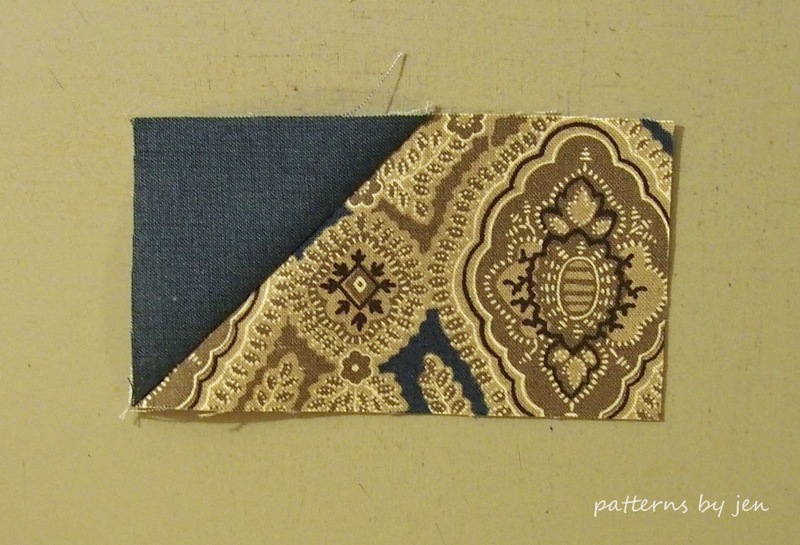 Stitch 1/4" on either side of line. 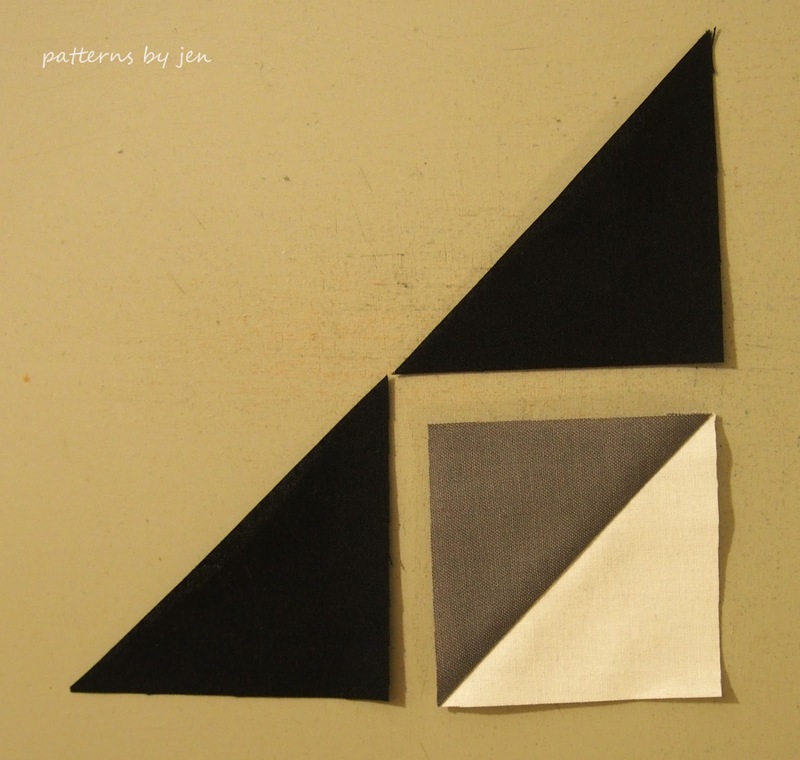 Press towards triangles. 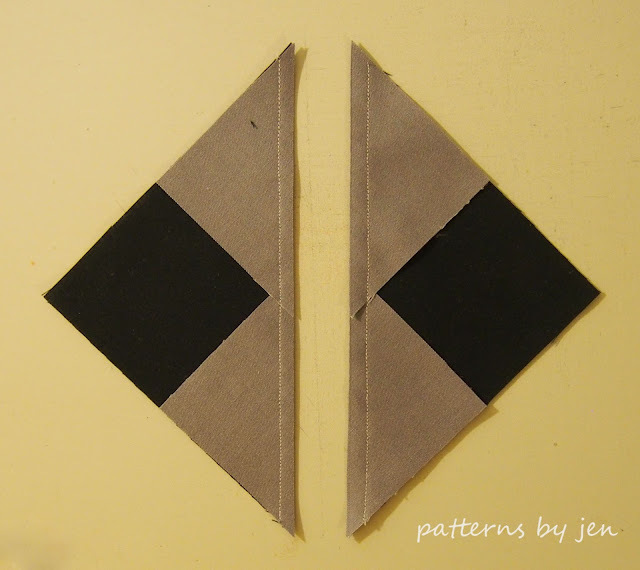 This method will give you four Flying Geese units. 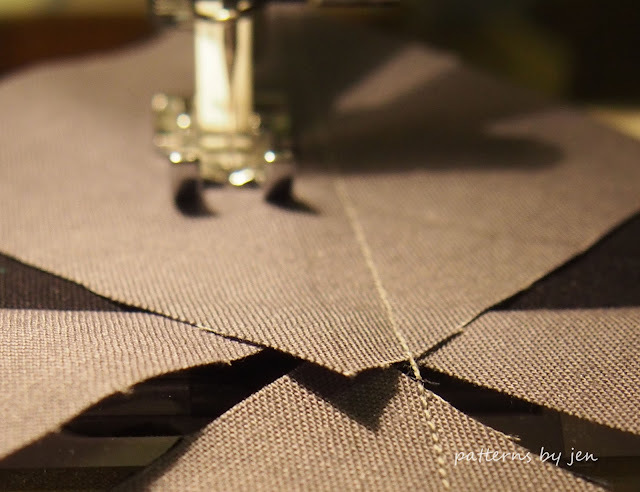 The lines on the Wing Clipper® make it really easy to know where to trim. We are trimming these to 2 1/2" x 4 1/2". Find the little diagonals for the 2 1/2" mark and line it up with the point. Trim. 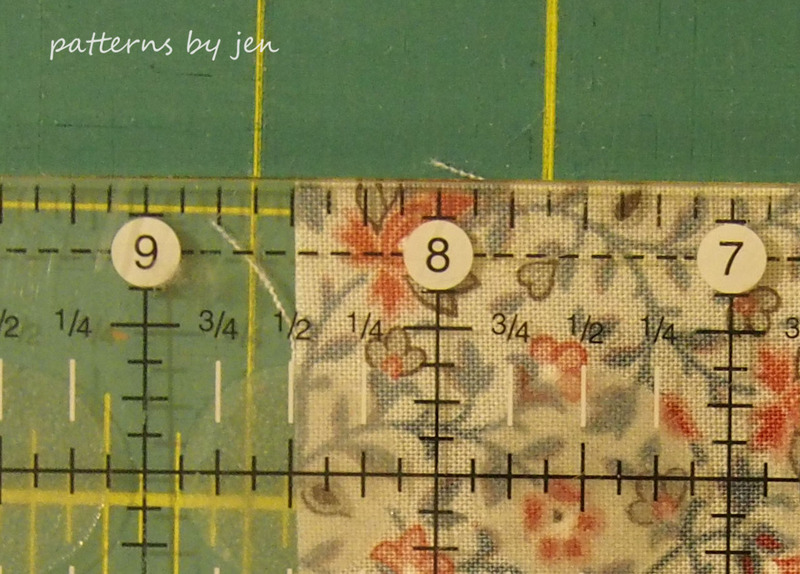 I like to make a mark on the half way point on the ruler. 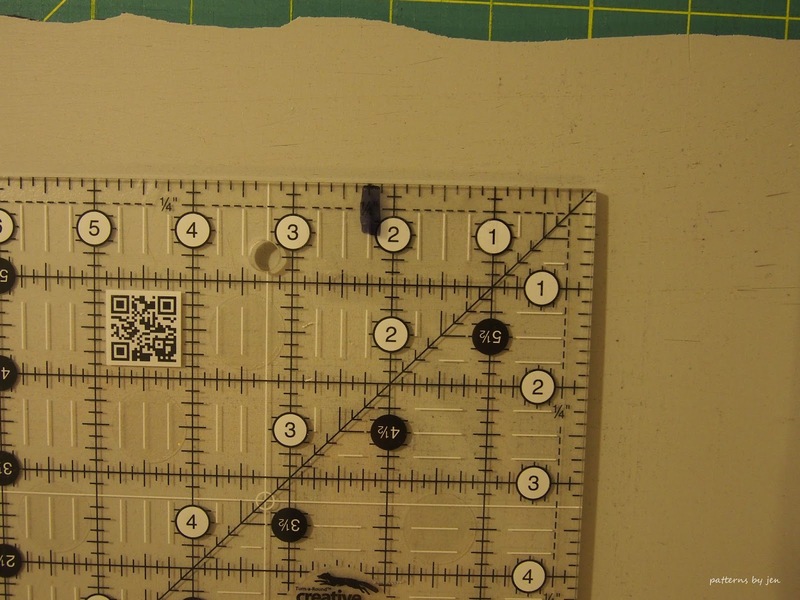 Use a sharpie and put a piece of scotch tape or packing tape over it if you have a lot to trim, because it will wear off. 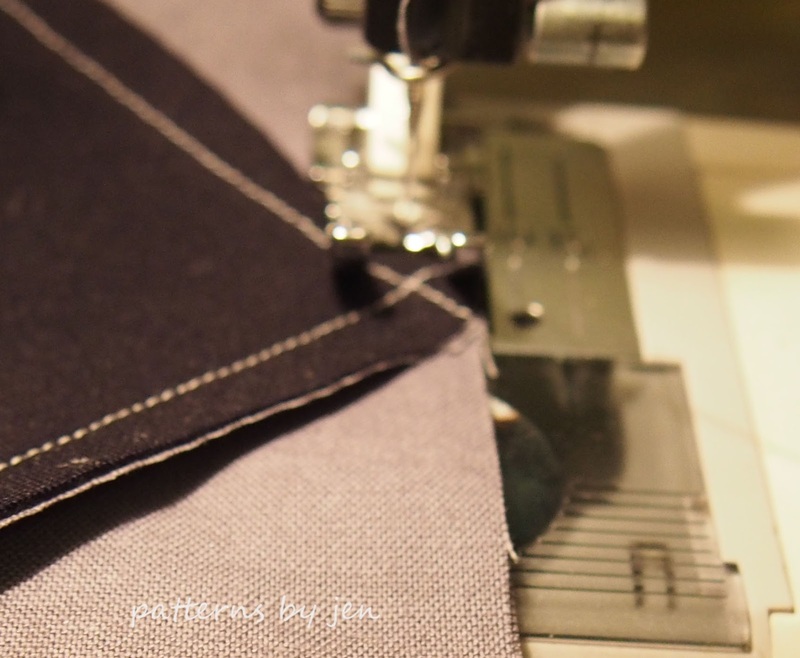 Line the half way mark (in this case 2 1/4") with the point, making sure to give yourself 1/4" seam allowance as well. Trim. Rotate FG unit and line up the cut edge on the 4 1/2" line. Trim. Draw a diagonal line on the wrong side of the 2 1/2" squares. Place one square right sides together on the rectangle. 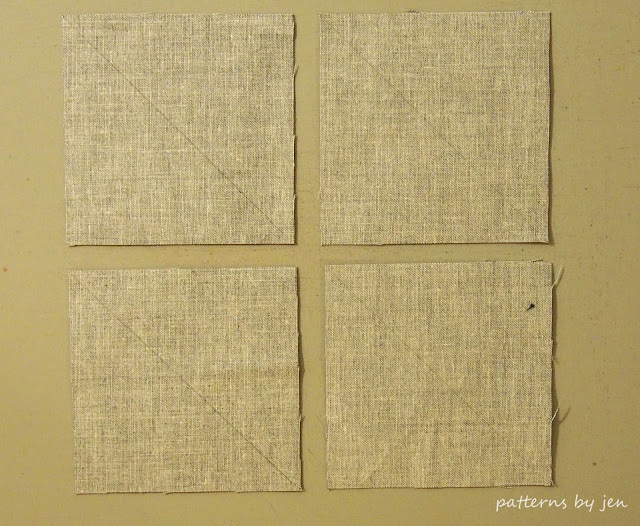 Note direction of drawn line. Stitch. 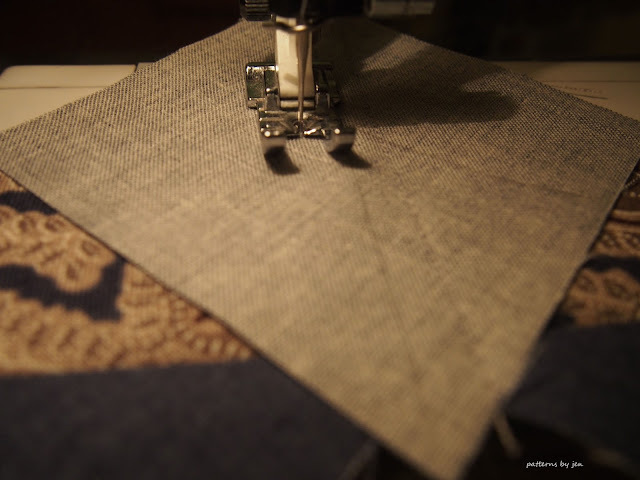 I like to stitch just a tish off the line, towards the outside corner. Place the other square on the rectangle, noting direction of drawn line. Press and trim. This will give you one Flying Geese unit. All 3 Flying Geese units, and you can't tell which one is which, so do the one you enjoy doing. Quilting is about joy and beauty. 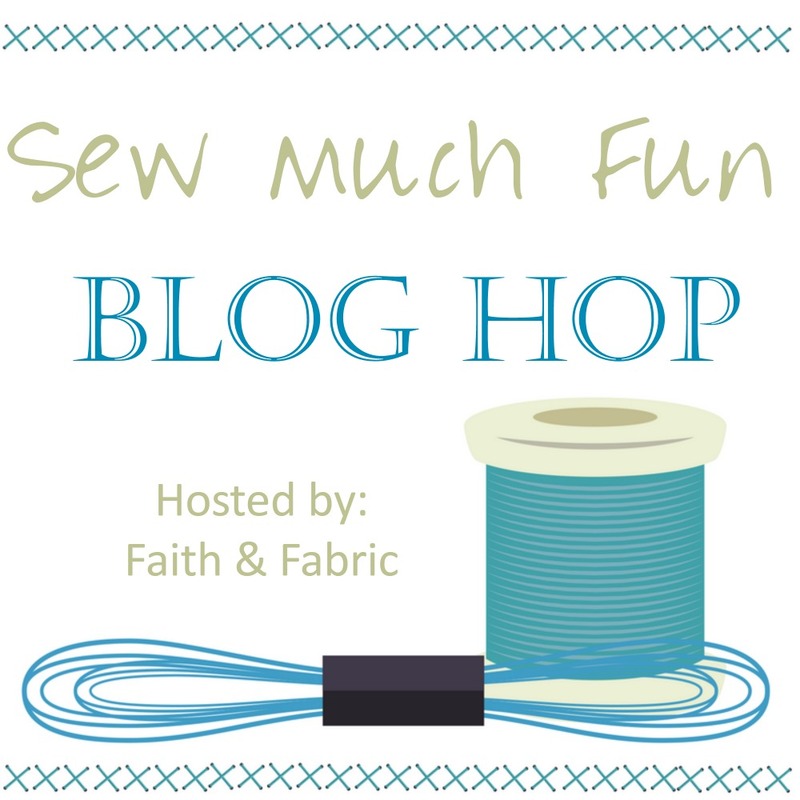 Welcome to my stop on the Sew Much Fun Blog Hop! Thank you so much to Jen of Faith and Fabric Designs for hosting this awesome blog hop. 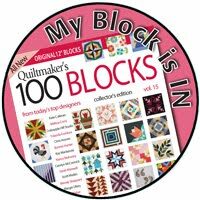 Make sure you check out the other blocks shared by the bloggers listed at the end of this tutorial. 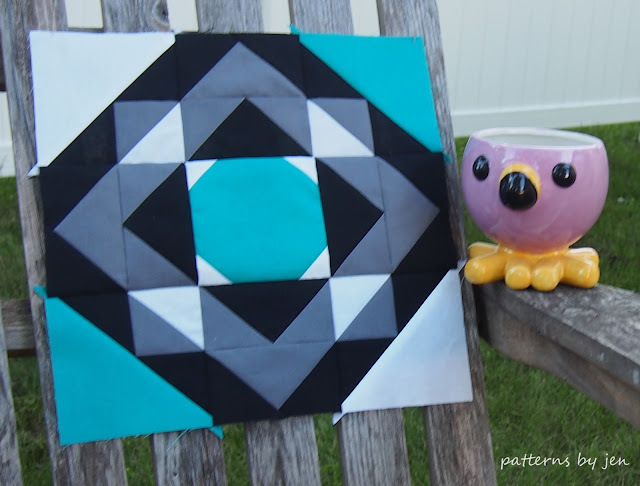 Today I have a block tutorial to share, as well as requirements and instructions to make a lap sized quilt. Enjoy Here a Square, There a Square! 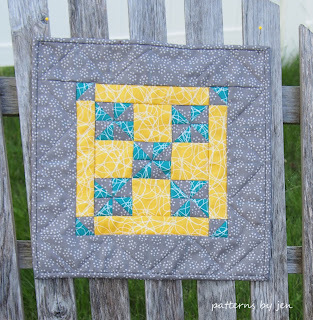 Download the instructions for the block and lap sized quilt HERE. 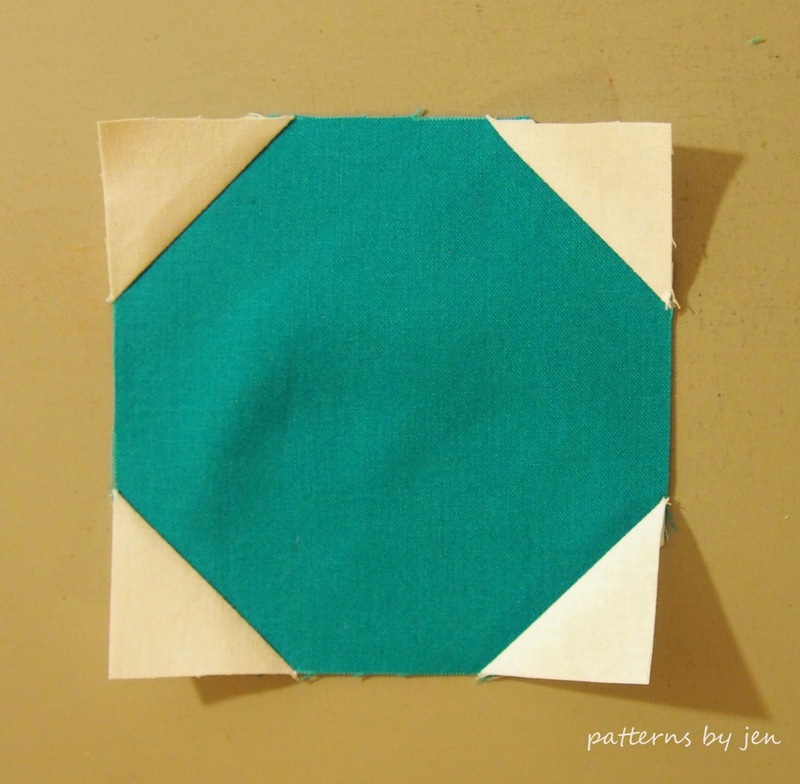 Align a white square in one corner of your 4 1/2" teal square, right sides together. Note the direction of the drawn line. 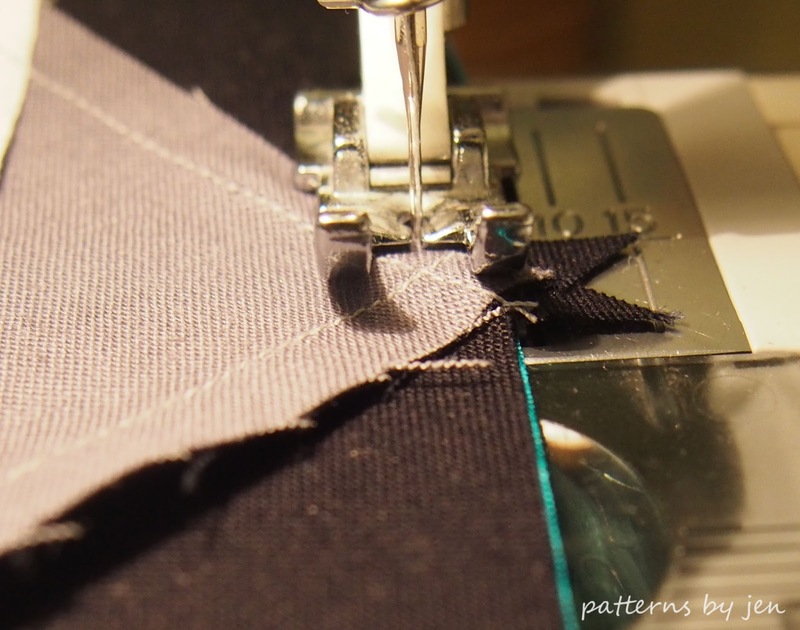 Stitch just along the drawn line, keeping your needle on the side closest to the outside corner. 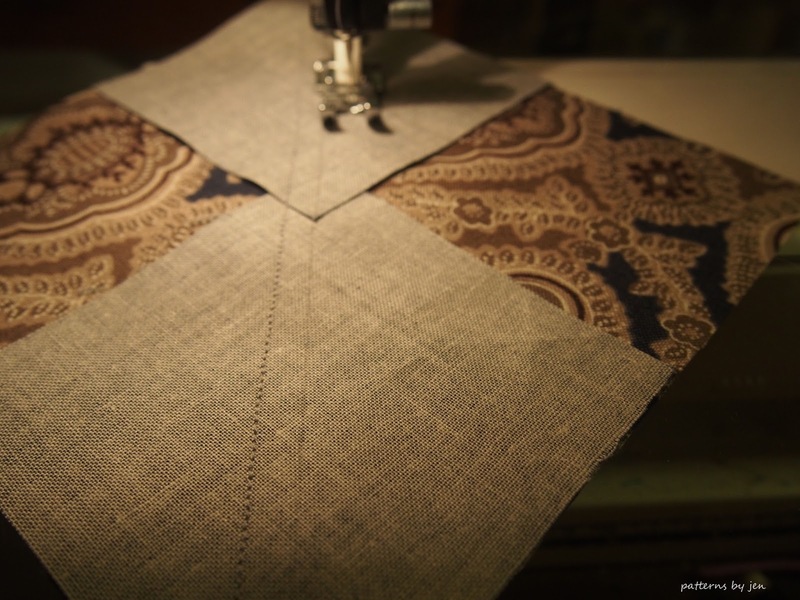 Set your seam by pressing briefly with a hot iron, then press triangles towards the outer corner. 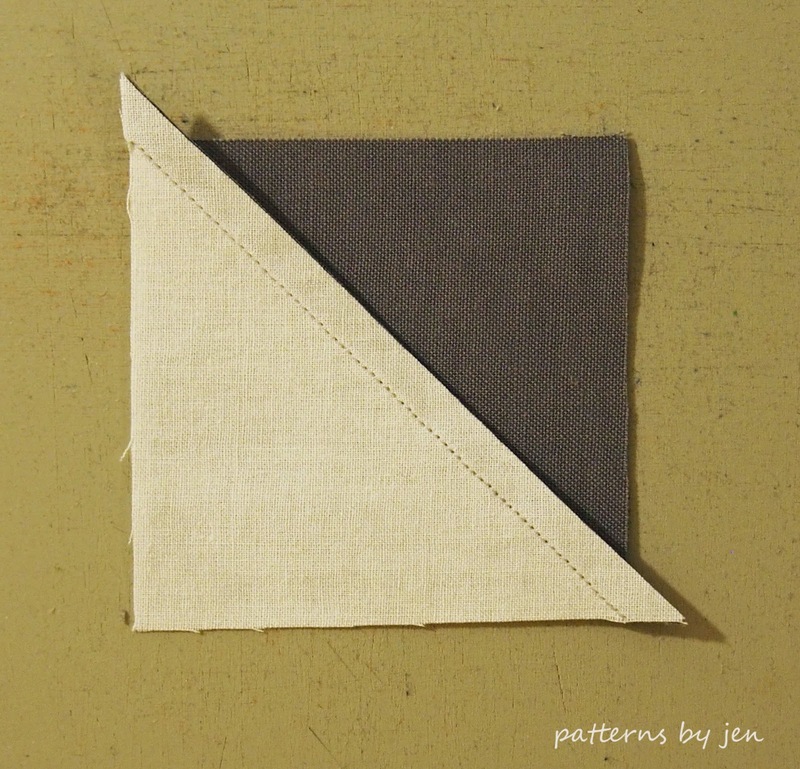 On the wrong side of the grey 2 7/8" squares, draw a line on the diagonal. 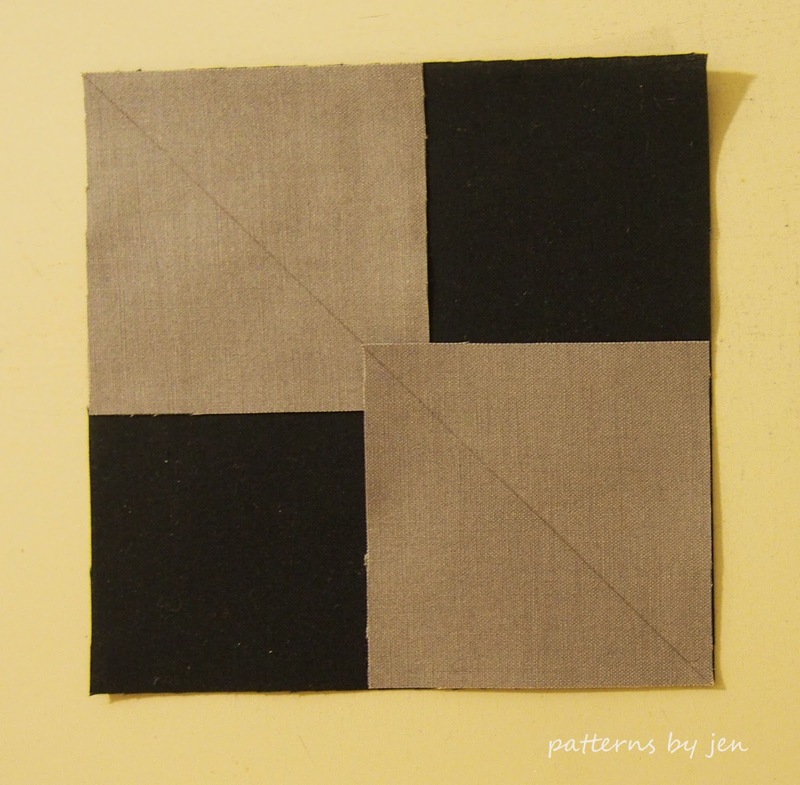 Lay two grey squares on the 5 1/4" black square, right sides together. 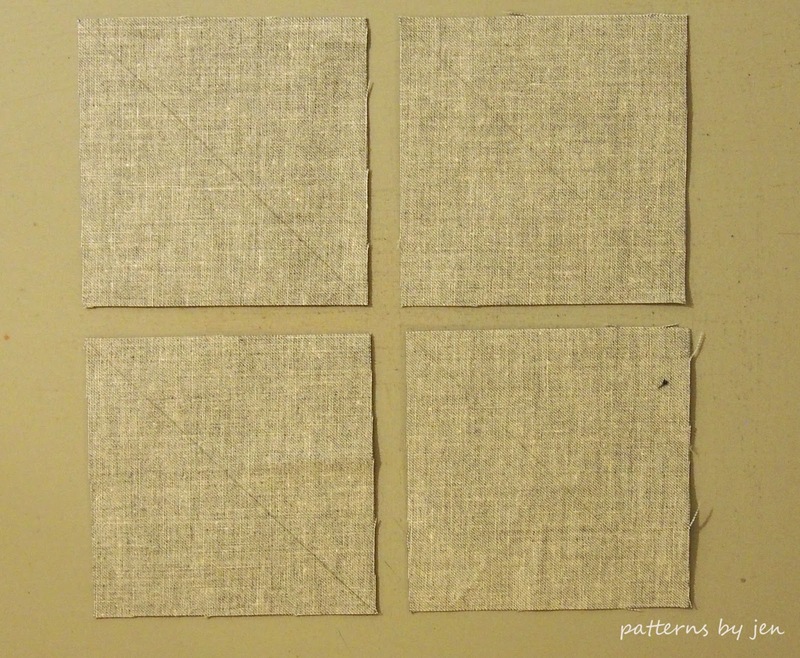 Note the direction of the drawn lines. Stitch 1/4" on one side of the drawn line. 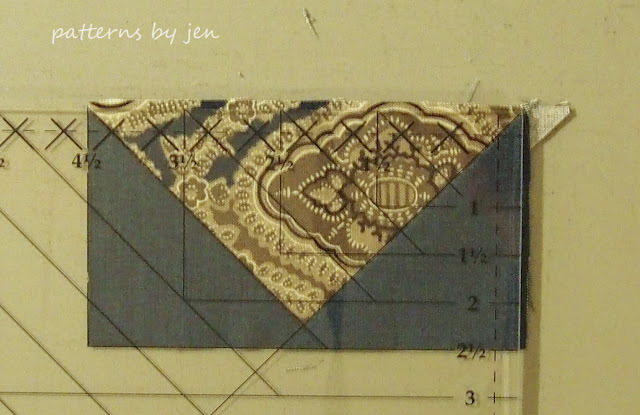 On my 1/4" foot I like to keep the drawn line under the foot, not alongside it. Rotate block and stitch a 1/4" from drawn line. 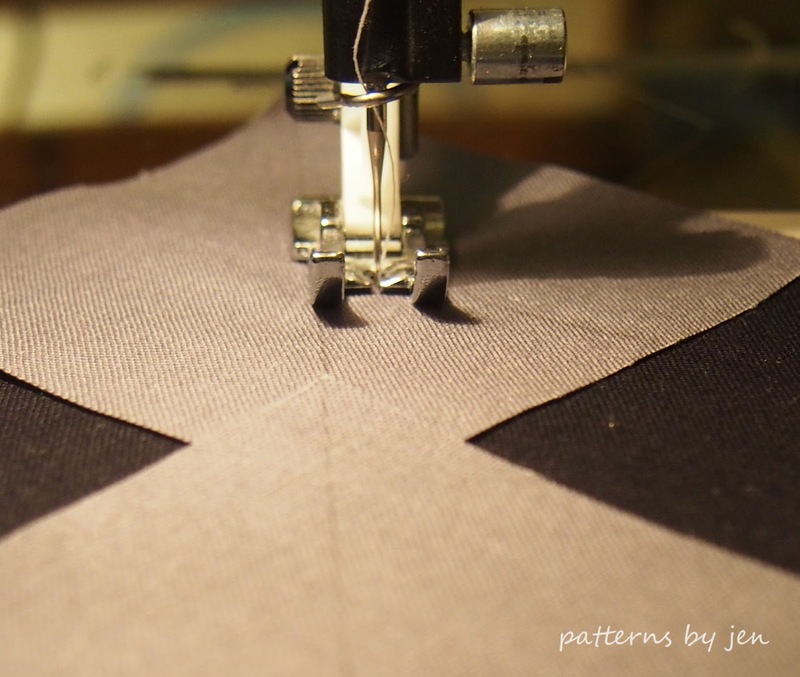 Set your seams with a quick press, then press towards the triangles. 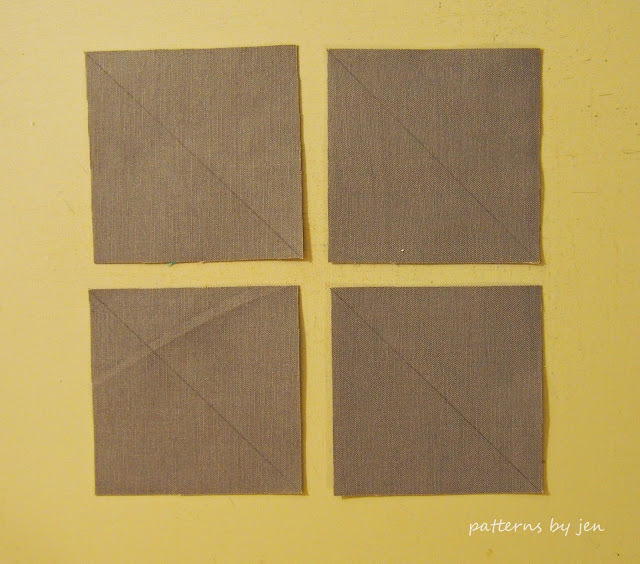 Place a grey 2 7/8" square on each new unit, noting direction of the drawn line. Stitch 1/4" on either side of the drawn line. Set seams and press towards triangles. Trim to 2 1/2" x 4 1/2" if necessarily. 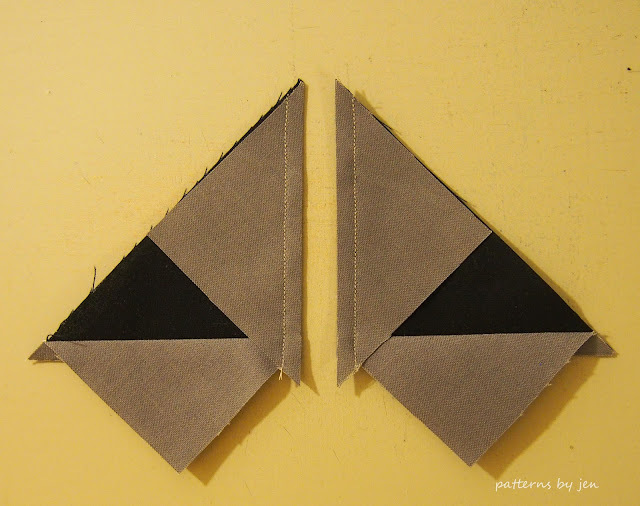 Line up Flying Geese units as above. 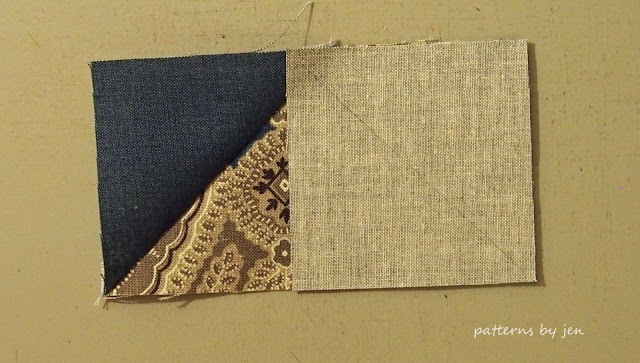 Stitch so you can see where the point would meet the seam. Press down towards black FG unit. Using the 3" white and grey blocks, make four half square triangles (HST). 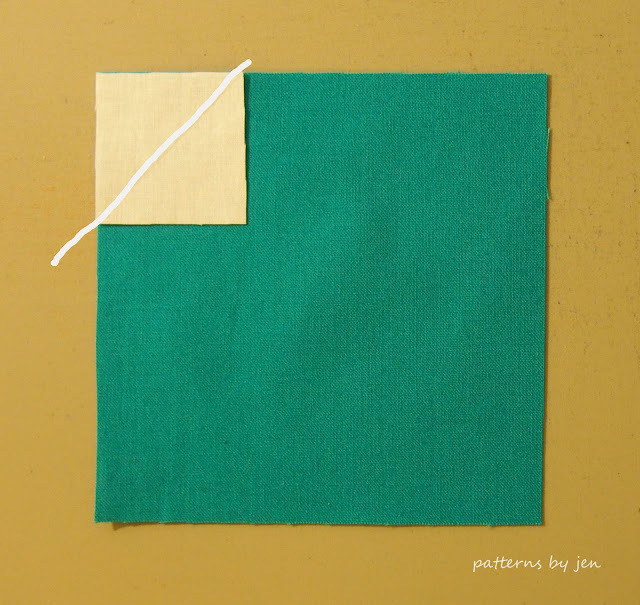 Draw a diagonal line on the wrong side of the white squares. 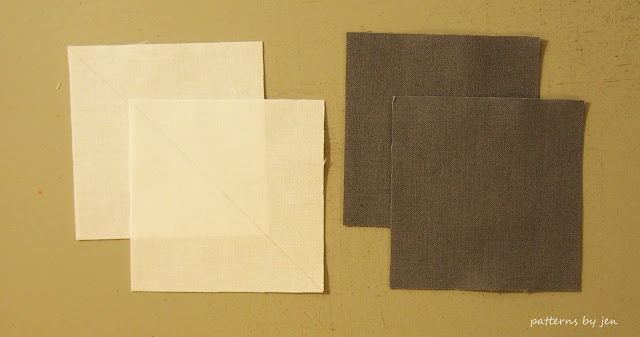 Match one white square with one grey square, right sides together. 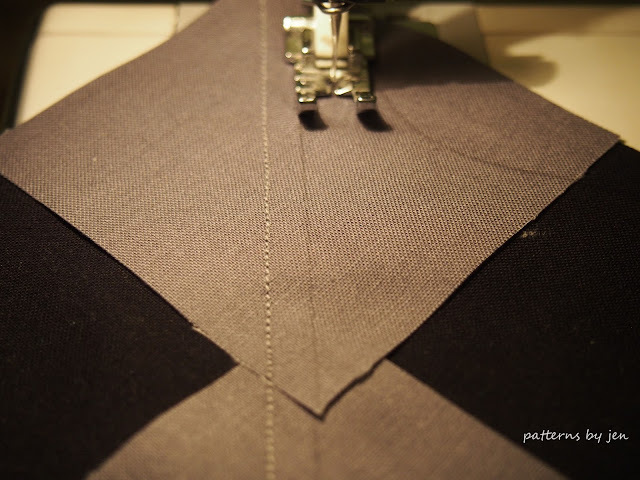 Sew a 1/4" on either side of the drawn line. 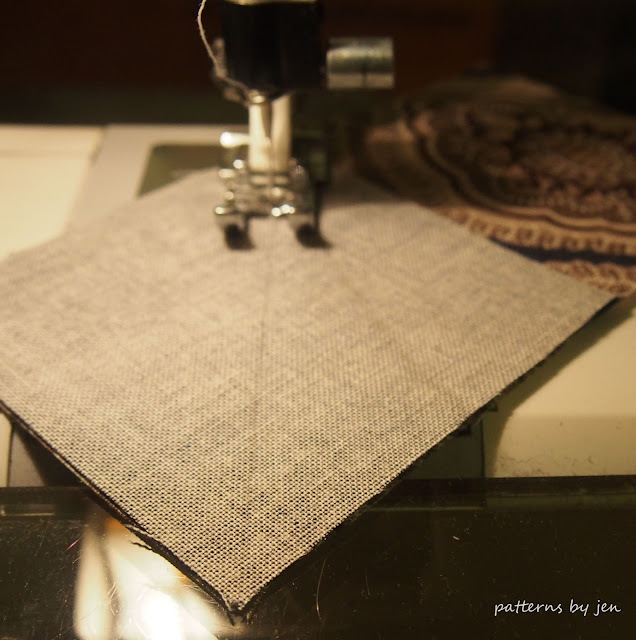 Set your seams with a quick press, press towards grey. 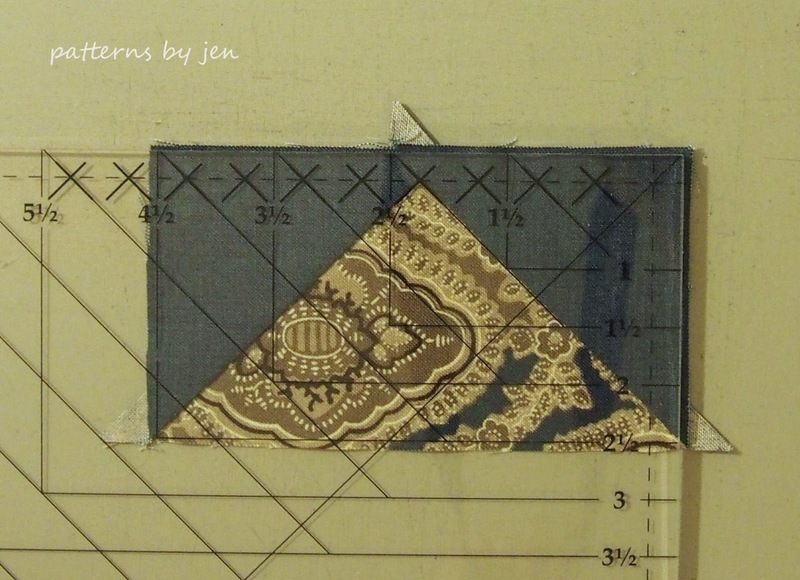 Square to 2 1/2". 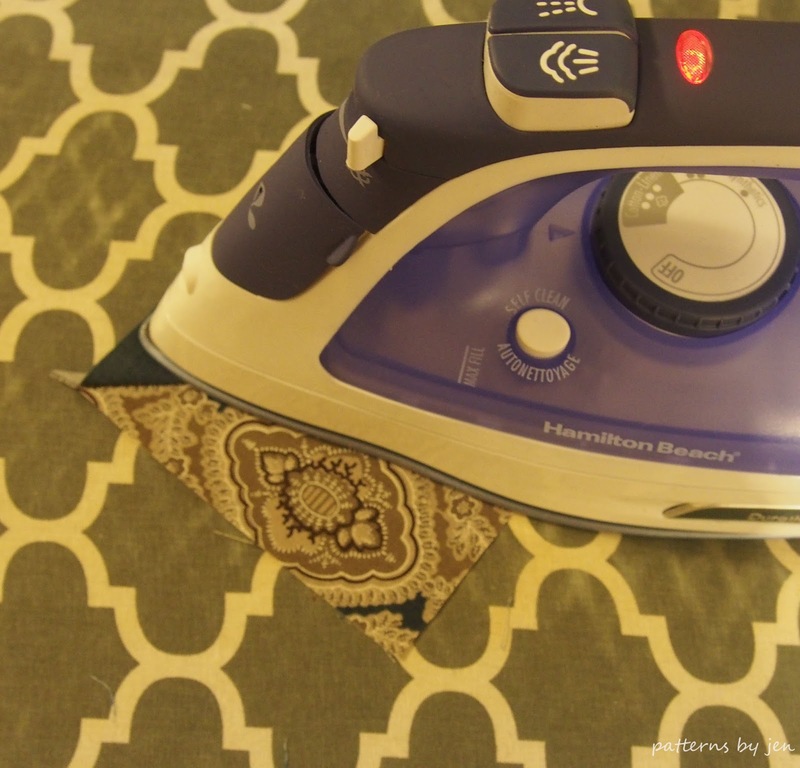 To see how I make my HST units see this post. Add a black triangle to your squared HST. 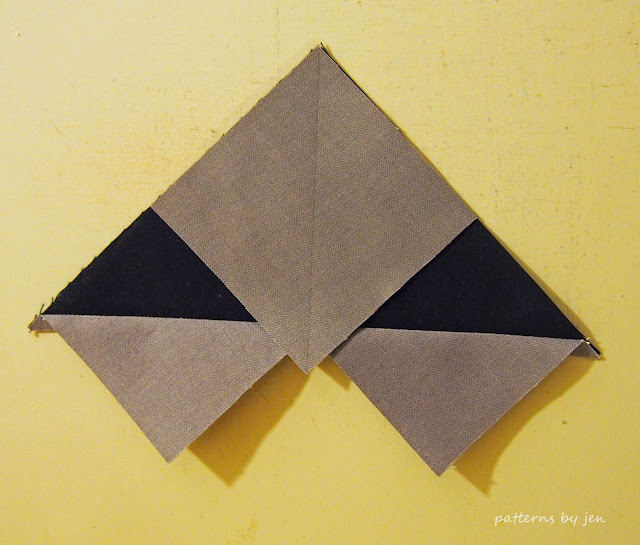 Note the direction of the triangles, as well as the position of the HST. Stitch one side, set seam, press towards triangle. Repeat for last three HST units. 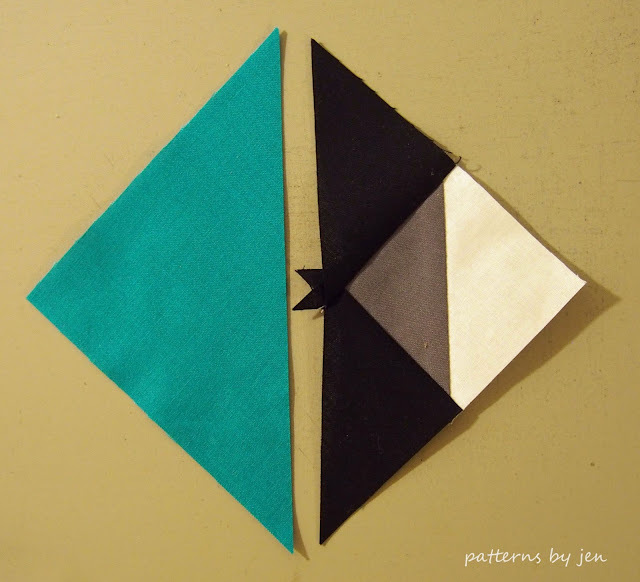 Add the white triangles to two of these units and the teal triangles to the other two units. I like to stitch these pieces together with the pieced unit on top so I can make sure I don't lose that point. Stitch carefully, and slow down if you need to. 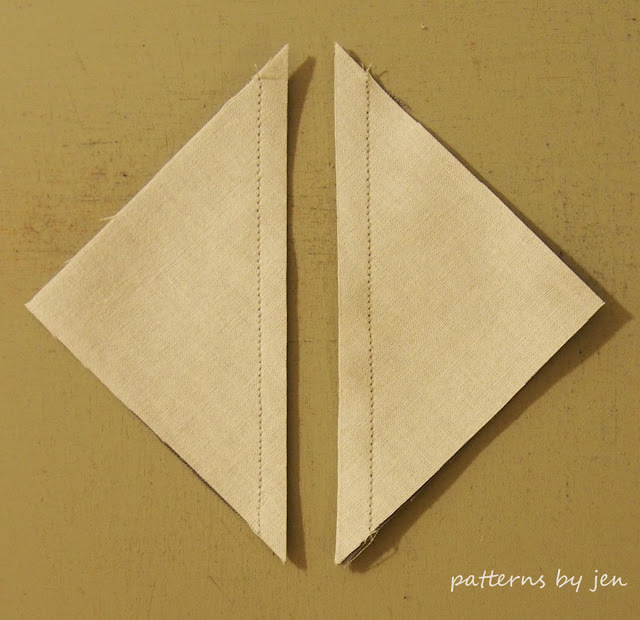 The triangle pieces are cut on the bias, so they will stretch if you aren't careful, don't pull or push, just guide. 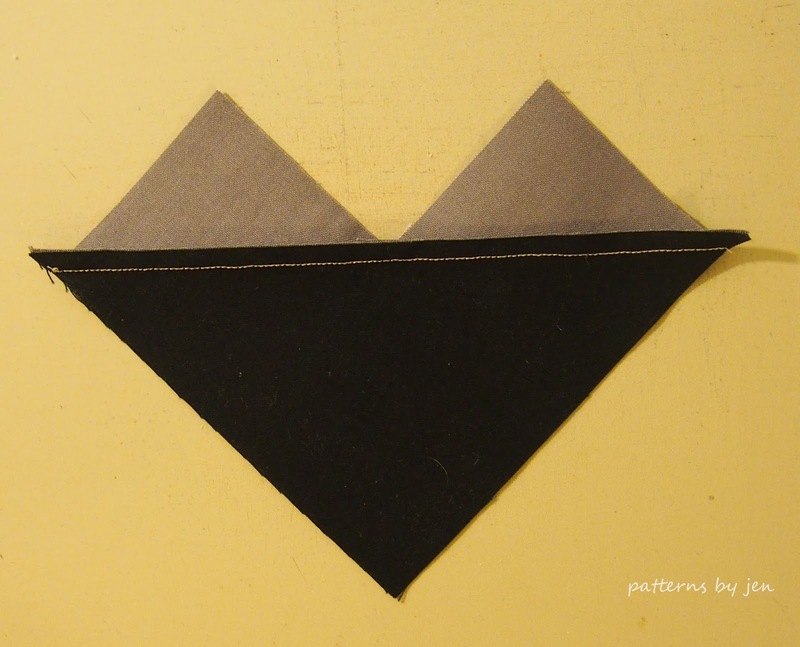 Press towards triangles. 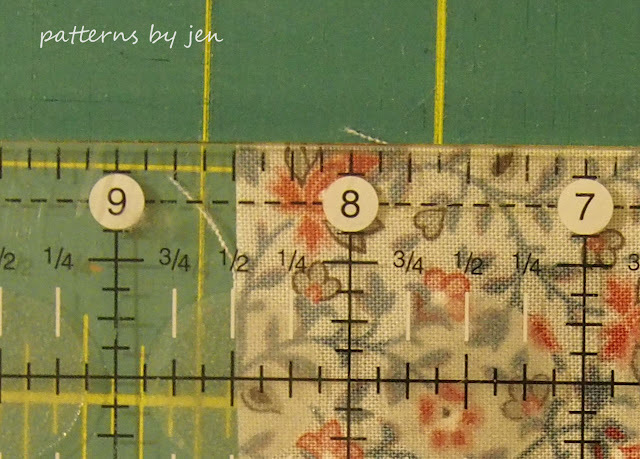 These units should measure 4 1/2" square. 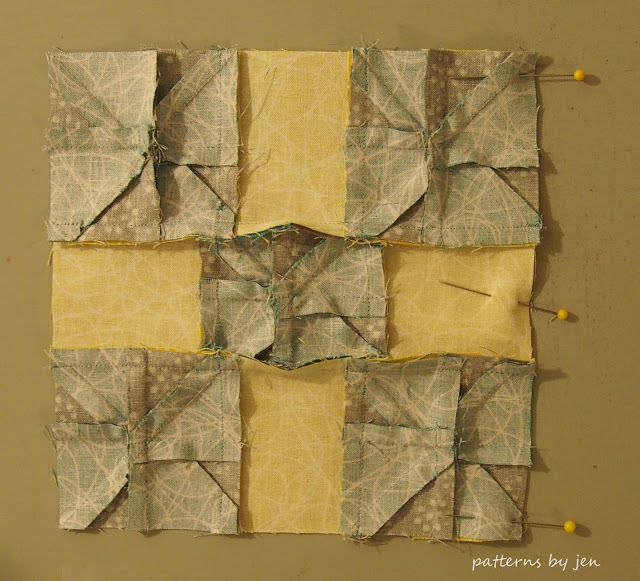 Lay out your block. Note where the large white and teal triangles are placed. 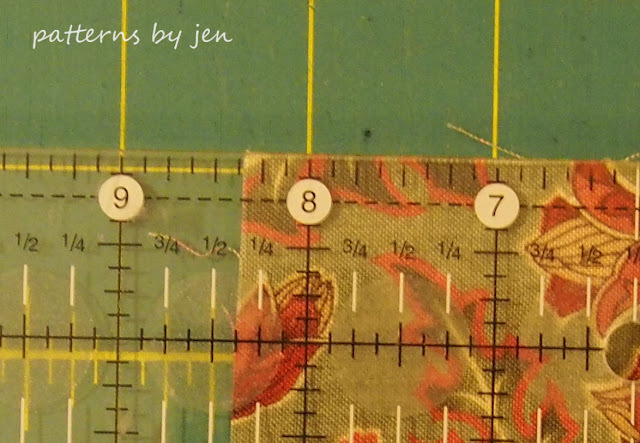 Sew the units in each row together. 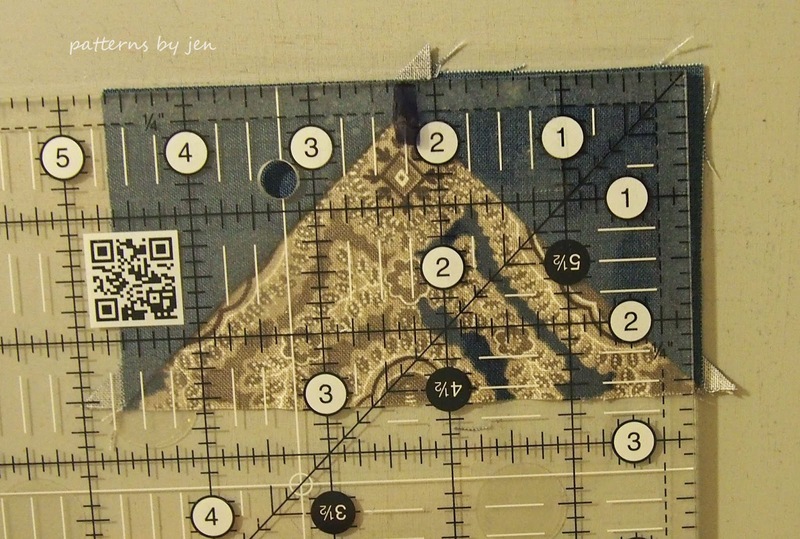 Press the top and bottom rows towards the Flying Geese units and the middle row out towards the Flying Geese units. Sew rows together. Press towards top and bottom rows. 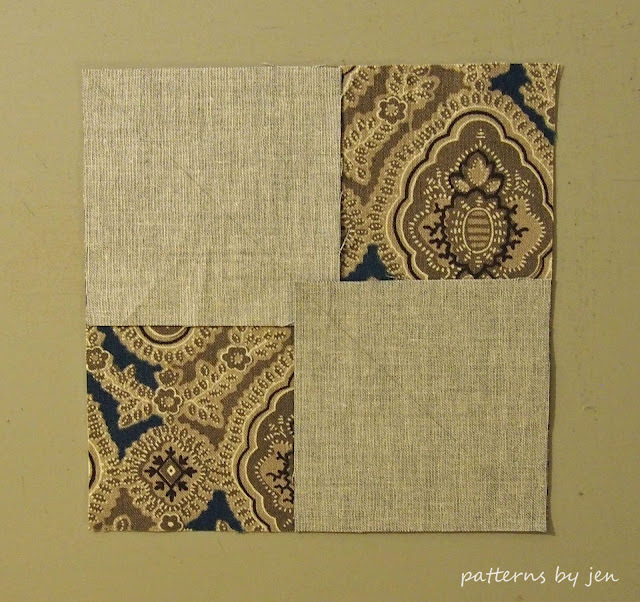 If I am making a quilt that uses the same block throughout, I will use that opportunity to chain piece as much as possible. With this block I would make each section at a time. 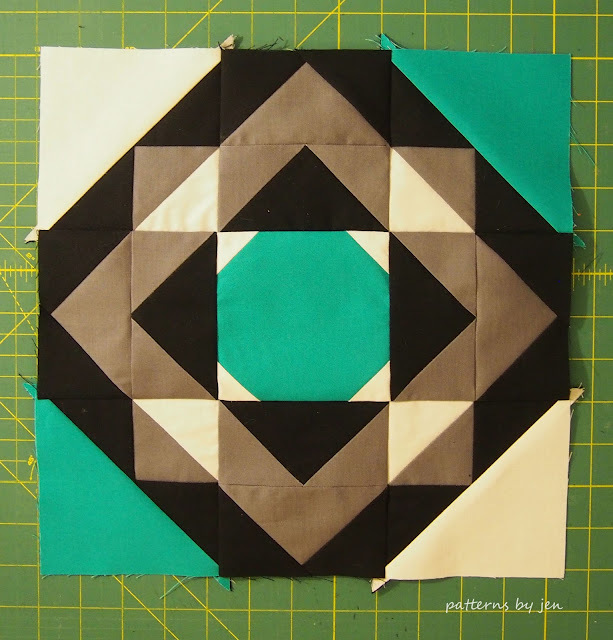 30 center, 60 Flying Geese, and so on, and then assemble all of the blocks. 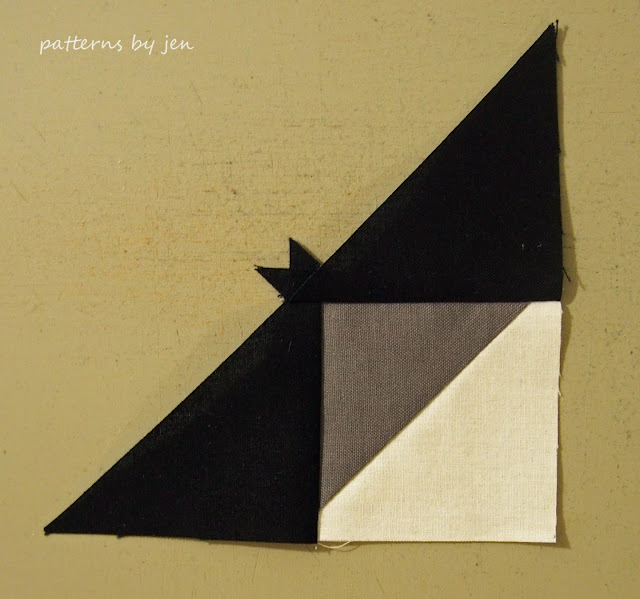 I do this only after I have made one block to make sure it is correct. The lap sized version of Here a Square, There a Square. If this is your first visit you may like to check out my Beginners Unite! A beginning quilting series, and/or the Muggamo quilt along, a free mug rug pattern every month. You can also follow me on Facebook and Instagram. 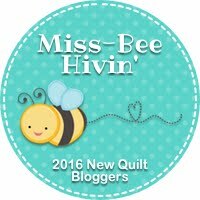 Make sure you check out the other bloggers and the blocks they have designed just for you.